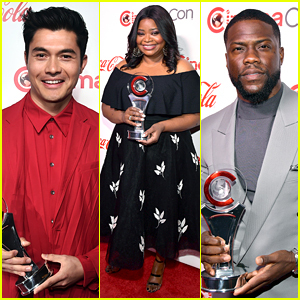 Henry Golding, Octavia Spencer, and Kevin Hart show off their awards on the red carpet at the 2019 CinemaCon Awards on Thursday (April 5) at The Colosseum at Caesars Palace in Las Vegas. Henry won the Male Star of Tomorrow award, Octavia was presented with the CinemaCon Spotlight Award, and Kevin received the International Star of the Year. Also in attendance at the event were the cast of Terminator: Dark Fate – Linda Hamilton, Mackenzie Davis, Gabriel Luna, and Natalia Reyes – who won the CinemaCon Ensemble Award. Jamie Lee Curtis was presented with the CinemaCon Vanguard Award, Steve Buscemi received the CinemaCon Icon Award, and David Harbour won the Action Star of the Year award. Henry was joined at the event by his Last Christmas director Paul Feig. FYI: Mackenzie is wearing Stella Luna shoes. Arnold Schwarzenegger is all smiles on stage during the 2019 CinemaCon on Thursday (April 4) at The Colosseum at Caesars Palace in Las Vegas. The 71-year-old actor and former Governor of California was joined on stage by co-stars Linda Hamilton, Mackenzie Davis, Natalia Reyes, and Gabriel Luna as they previewed the upcoming Terminator: Dark Fate – which hits theaters on November 1. Also hitting the stage during the event was Taron Egerton and his Rocketman director Dexter Fletcher. The film hits theaters on May 31. 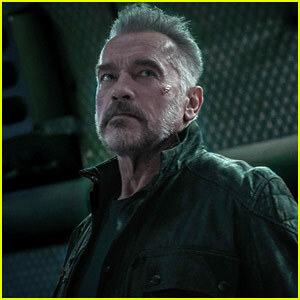 'Terminator: Dark Fate' Stills Released! There are six new images from Terminator: Dark Fate, which will hit theaters later this year! The movie is set to take place after the events of Terminator 2: Judgment Day, but not many plot details are known apart from that. 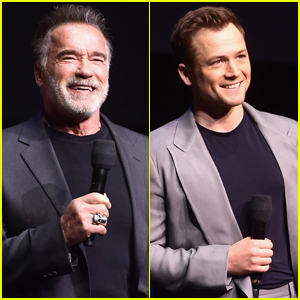 Linda Hamilton and Arnold Schwarzenegger are returning to their iconic roles as Sarah Conner and T-800 and are joined by Mackenzie Davis, Natalia Reyes, Gabriel Luna, and Diego Boneta for the new movie. The movie is set to hit theaters on November 1, 2019. Be sure to check it out! It was a Pinkett-Smith family affair at the 2019 Sundance Film Festival! 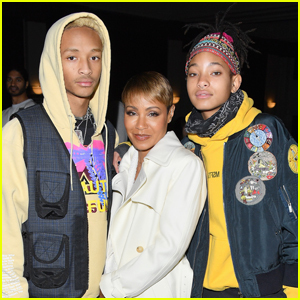 Jada Pinkett Smith was joined kids Jaden and Willow at the premiere of her new movie Hala on Saturday (January 26) at the Library Center Theater in Park City, Utah. Jada serves as executive producer on Hala, which Minhal Baig directed. Stars of the film including Geraldine Viswanathan, Anna Chlumsky, and Gabriel Luna also attended the premiere. Jada‘s brother Caleeb Pinkett and YouTuber Liza Koshy were also in attendance. FYI: Jada is wearing an âme ear cuff. The ladies of Marvel’s Agents of S.H.I.E.L.D buddy up on the red carpet as they celebrate the show’s 100th episode on Saturday night (February 24) at OHM Nightclub in Hollywood. The ladies – including Natalia Cordova-Buckley, Ming-Na Wen, Maurissa Tancharoen, Elizabeth Henstridge, and Chloe Bennet – went chic in a black and white suits for the event. Fellow co-stars Clark Gregg, Brett Dalton, Constance Zimmer, Iain de Caestecker, Jason O’Mara, Jed Whedon, Jeffrey Bell, Patrick Brian Wade, and Dove Cameron with boyfriend Thomas Doherty were also in attendance. Marvel’s Agents of S.H.I.E.L.D.’s 100th episode titled “The Real Deal” is set to air on ABC on Friday, March 9. FYI: Natalia, Ming-Na, Maurissa, Elizabeth, and Chloe all wore jewelry by Dena Kemp. Chloe Bennet & 'Agents of S.H.I.E.L.D.' Cast Celebrate Season 4 Premiere! 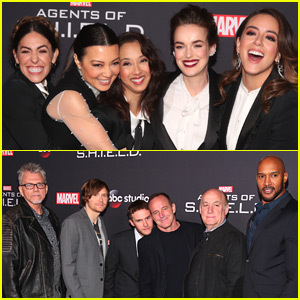 Chloe Bennet is the lady in white at the season four premiere of her hit show Agents of S.H.I.E.L.D. held at Pacific Theatre at The Grove on Monday (September 19) in Los Angeles. The 24-year-old actress was joined at the event by her co-stars Elizabeth Henstridge, Iain De Caestecker, Ming-Na Wen, Henry Simmons, Maurissa Tancharoen, Gabriel Luna, John Hannah and Natalia Cordova-Buckley. Season four of Agents of S.H.I.E.L.D. is set to premiere tonight (September 20) in its new time-slot, 10:00 PM ET on ABC – Watch the teaser trailer below!